The Travel Bug: We're off to the Movie (World)! 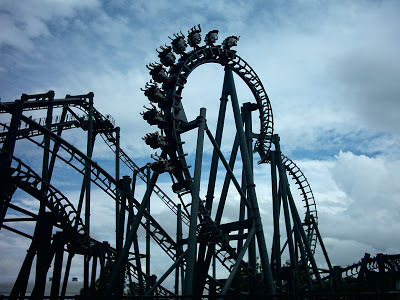 Our second theme park escapade, this time to Movie World! The kids got their momentum going by riding on the kids' coaster, the Road Runner. In 2006, this was Lesley-Anne's first experience in a roller coaster and she found it scary. Seven years later, the kids found this disappointingly boring. I guess you can say they've grown up. 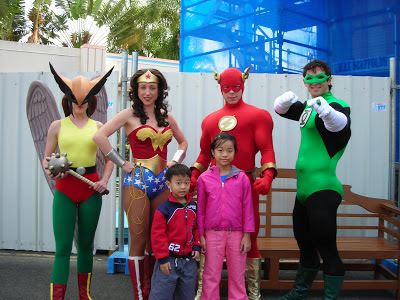 A new ride from 2006 was the Justice League 3D ride. You wear 3D glasses on this ride and use the laser guns to shoot as many starro spores (targets) as possible. If you've been to Disneyland, it's somewhat similar to the Buzz Lightyear Astro Blasters ride but less sophisticated. Nobody can beat Disney when it comes to animatronics. It's quite fun though and a good one for individuals who hate fast rides or have motion sickness issues. The ride confirmed my suspicion - I am a dud shot. I probably couldn't get a hit even if the target was wearing a giant bulls-eye right across its chest. Among the four of us, Andre topped the score chart with more than 82,000 points. A water ride - Wild West Falls. 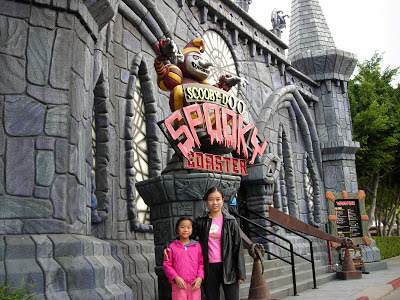 Another ride re-visited - the Scooby Doo Spooky Coaster. This is an indoor roller coaster in the dark. The track is not actually as scary as some others but it seems scarier because you can't see where the drops are. In 2006, I persuaded Lesley-Anne to take this ride with me and she emerged almost in tears (even though you can't tell from the picture below). She has blamed me for her fear of coasters since then. Not afraid anymore! Well, not too much. This time, she went on the ride voluntarily and had a new companion. Mummy has grown more chicken over the years. My roller coaster riding days are behind me. We found ourselves a spot at the Hollywood Stunt Driver Show. It's highly entertaining, much better than the old Police Academy show they used to have. We also caught the Ice Age 4D show but this one turned out to be a total rip-off. Quite unlike other 4D shows like the old Shrek one which are from your point of view, to give you the effect that you're going on a ride in the show, this is merely a 4D version of a portion of the Ice Age movie. It's pretty lame. 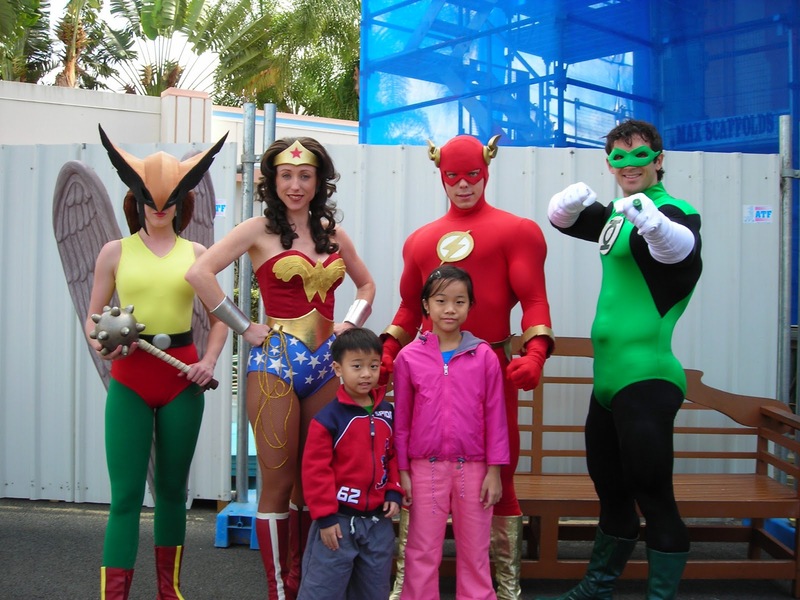 In the whole park, my kids' favourite ride was the Green Lantern roller coaster. Touted as "the steepest inverted drop in the southern hemisphere", it has various sharp turns and corkscrews. It looked pretty terrifying to me but my kids claim it's not as scary as it looks. They went on this ride multiple times. Here's a video we took of the ride. The kids are seated in the front row, far side. Before we arrived in Gold Coast, Andre had planned to go on the Arkham Asylum roller coaster but unfortunately, it was down for annual maintenance when we were in Movie World. This is a renamed coaster. It used to be called Lethal Weapon (pic taken in 2006). Quite surprisingly, it was Lesley-Anne who then suggested to Andre that they go on Superman Escape. Now, this is a roller coaster of epic proportions. You're propelled out at 100km per hour and at one point, there is a 90 degree drop. I'm not sure why Lesley-Anne suddenly became so brave during this trip. I think she always had the grit in her but just needed to bring it out of hiding. She treats roller coasters now like a personal challenge, which I guess is one way of channeling one's inner courage! Here's a video of the ride. You couldn't pay me to go on this. After Superman Escape, Lesley-Anne said she feels like can face anything! The last ride the kids tried was the Batwing Spaceshot. You're shot 60m upwards and then dropped back down. Here's a video clip. Luckily, Lesley-Anne went on this when she was all fired up after Superman Escape because she said she left her heart up the tower of the Batwing. Never again! A last look at the park before we departed. Green Lantern's insignia could be seen for miles. Pretty cool.